Whether it concerns file-sharing, streaming algorithms or secret album drops, there’s no shortage of analysis on the myriad ways the internet continues to transform the music industry. From the moment Napster hit headlines (and Metallica’s swollen wallets) at the dawning of the millennium, discussion of disruptive technologies has dominated the self-flagellating conversation about how we, skint fans turned morally dubious consumers, interact with the music we proclaim to value and love in an anarchic digital age. What very few observers talk about is the simultaneous, quieter revolution that the internet has ushered in: the removal of the traditional barriers between musicians and fanbases. Back in the sepia-tinged, pre-MTV’s Cribs 1990s (when ‘social media’ meant clustering round your friend’s tiny TV to share some serious Fresh Prince of Bel-Air chuckles) the thoughts and lives of artists were shrouded in mystery. Fans would buy up tastemaker publications such as Melody Maker and NME to obsess over every word of each interview with their idols, desperate to peer behind the curtain and catch a glimpse of the real Kurt Cobain/Madonna/Marilyn Manson. It’s easy to fetishize that era now that millions can savour every minutiae of Selena Gomez’s ‘private’ life, but truthfully this lost secrecy was rarely self-imposed. The most famous enigma of all, David Bowie, was one of the first innovators to bypass these longstanding gatekeepers of fan-artist relations and start communicating with his en masse via the messageboards of his pioneering fansite Bowienet. There he planted the seed of a powerful concept: an artist can touch the collective mind of his or her fanbase, not indirectly through the semi-mystic medium of their music, or privately via fan mail, but through the open public correspondence of an online forum. Snap forward to 2018 and The Red Hand Files, the latest project from another artist often wrongly accused of being an ‘enigma’. Much like Bowie, Nick Cave is an outlier, a cracked oddity in a world of smooth vessels who, in the normal scheme of things, should really have lived out his career as an experimental cult performer à la Ivor Cutler or Arabrot, but who has, through some quirk of fate, found enough popular success to tour stadiums. His idea behind the Red Hand Files is simple, ‘You can ask me anything. There will be no moderator. This will be between you and me. Let's see what happens’. This approach, codified by Reddit in the early 2010s as the recognisable AMA, is almost as old as the internet itself (proto-AMAs began on the legendary humour site Something Awful, early stomping ground of ‘Weird Twitter’ figures like @dril). But, of course, ‘Ask Me Anything’ does not mean ‘I’ll Answer You Anything’. The standard stage managed nature of these interactions, coupled with the fact they are generally set up to promote the featured artist’s upcoming tour/album/cookbook, mean that disclosures more revelatory than who can outsmoke Snoop Dogg are thin on the ground. You certainly don’t get subjects penning lengthy responses to questions about whether their spouse and they can communicate with the spirit of their recently deceased son, as Cave did last month. As anyone who has ever spent the majority of a house party locked in a single deep meaningful conversation will know, it’s the time taken responding to each question (which range in poignancy from dealing with grief to how many pets he has), coupled with Cave’s singular mastery of the English language, that invokes the sense of connection most artist-fan interactions lack, particularly on social media platforms. Theoretically, Twitter and sites of its ilk offer the ideal forum for artists to talk directly to fans. In reality, the only in-depth conversations tend to be the arguments stirred up by trolls and free speech over-enthusiasts. Though many notable artists such as David Crosby, Justin Timberlake and Cher regularly engage with their fans on Twitter, their interactions tend to be either a) brief, b) mercantile, or c) ironic (hello Rivers Cuemos and James Blunt). The Red Hand Files, on the other hand, is not a platform for Cave to crack jokes and hawk his wares. His absolute honesty is not subject to the self-censorship now essential for safely navigating dialogous social media platforms (his recent musings on the divisional nature of identity politics would go down like a cup of cold, ironic sick on Twitter). Instead, Cave’s latest experiment in vulnerability comes from the unprecedented position he finds himself in after what has been, without a doubt, the most tumultuous and interesting decade of his career. At the beginning of it he was finishing a run of increasingly critically and commercially ignored records, and would probably have been relegated to the impotent status of ‘elder statesman of rock’ were it not for his decision found his own label, put a renewed emphasis on streaming and online fan-engagement, and start publicly dissecting his own creative process via a pair of utterly unique documentaries (the dreamlike 20,000 Days On Earth and the unflinching masterpiece One More Time With Feeling). Thanks to this recalibration, and some bloody incredible songs, his career underwent a period of steep recovery in a typically counter-intuitive fashion: his music with The Bad Seeds became more experimental than ever while his fanbase ballooned, a desire for privacy after the tragic death of his son led him to create perhaps the most nakedly revealing exploration of grief ever committed to film, and the release of most dark, insular album of his career, ‘Skeleton Tree’, somehow led him to filling stadiums. All these factors play into explaining why The Red Hand Files is a far bigger deal than your average AMA announcement. 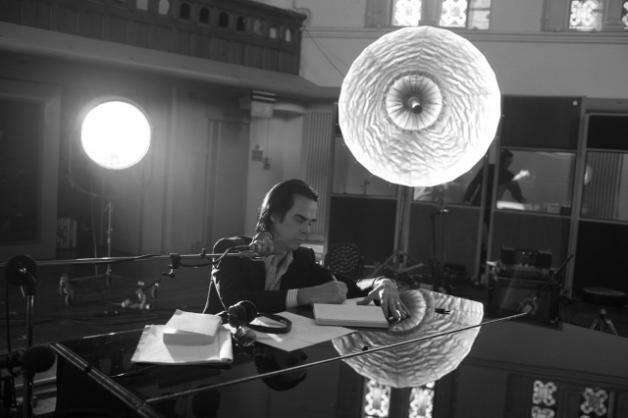 Nick Cave is not just a cult artist, he has become the Cult Artist. Anyone who has witnessed the climax of his latest series of shows, as he traverses the crowd feeding off their energy and attempting to physically touch as many of them as possible, will understand his ever- growing talent for transforming the personal into the communal and the intimate into the universal. An unholy alliance of anguish, digital experimentalism and growth in public stature has led Cave to realise the potential of online correspondence more completely than any other artist has managed in the last 20 years, Bowie included. He has put to bed the myth of the enigmatic artist, providing final evidence that intimacy we enjoy with our creators now trumps the romanticised detachment of yesterday every time. Visit The Red Hand Files HERE.